Dubai, UAE, March 17, 2019: These timepieces from COACH's Park collection, named for the glamorous New York City street, the Park watch is an elegant style perfect for day or night. 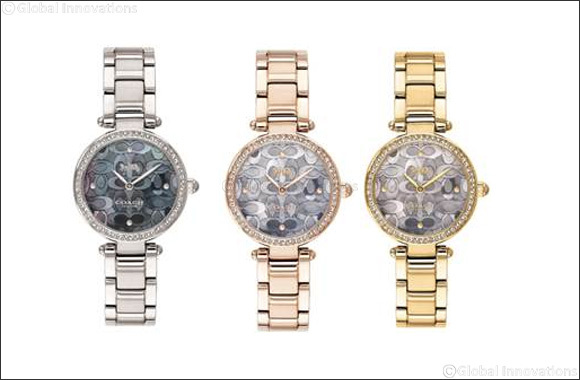 The various case finishes are set with Swarovski® crystals and showcase an intricate dial design in Mother of Pearl. Case Size available in 26mm / 34 mm. Quartz Movement. 3H. Stainless-steel / plated cases. Swarovski® Crystals. Water resistant 99 feet. Two-year limited warranty. Manufactured by Movado. Coach Time Piece – Defining modern luxury. Approaching design with a modern vision, authenticity innovation.